New Zealand's finest rowers produced some great racing today on the first finals day of the 2011 BankLink New Zealand Rowing Championships at Lake Ruataniwha, Twizel. World champion Hamish Bond and pairs partner Jade Uru produced a furious final 500 metre push to vanquish fellow world champion and NZ crew mate Eric Murray and his Waikato RPC partner David Eade in the Championship Pairs event. Eade and Uru were crew mates in the New Zealand four that took bronze at the Karapiro world championships - heightening the friendly but serious rivalry between the two boats. Murray and Eade looked good in the first half of the race, running with their opposition. Two national titles together and much more experience together as a crew showed for Bond and Uru, however, as they sprinted off to a two length victory at the line. Adam Tripp from the NZ men's eight and Nick Pusinelli were third for Auckland. It was closer still in the women's pairs race. With Juliette Haigh out with a back injury, it was left to world champion Rebecca Scown and her partner and fellow team member Louise Trappitt to do battle with Kelsey Bevan and Emma Feathery of Auckland for the top honours. In a superb race, the two crews slugged it out all the way down the course, and it was only in the final 200 metres that the more experienced Scown began to make her presence in the stroke seat felt. Scown and Trappitt, who had been unwell in the build up to the race, snuck a small lead but could not shake off the Auckland duo. Feathery is no stranger to top flight racing having partnered Scown to world bronze in 2009, and both her and Bevan kept up a frantic pace. The half length verdict at the line indicated it had been a tough race for the world champion, but a good way to kick off the first of three finals for Scown. The women's lightweight single scull wasn't the cracker people were hoping for, with Southern RPC's Lucy Strack dominating the race and looking just a tiny bit more pacey and powerful than her high quality rivals. World silver medallist Louise Ayling chased her hard, but had to settle for second ahead of Strack's current light double sculls partner Julia Edward. In the men's event, Peter Taylor produced a great row to beat three time world champion Duncan Grant, but this too was a close race and the final verdict was Taylor by just one boat length. Third was a great result for Todd Petherick, ahead of former Under 23 light single scull world champion Graham Oberlin Brown and his Karapiro team mate James Lassche - both now experienced internationals. Another top Kiwi rower was in action in the first event of the day, the elite adaptive final. This was effectively a demonstration race between world bronze medallist Danny McBride and a new double combination of - the bigger boat prevailed, though McBride kept them well within his sights for the majority of the 1,000 metre race. In the non elite classes, there was some fantastic racing. 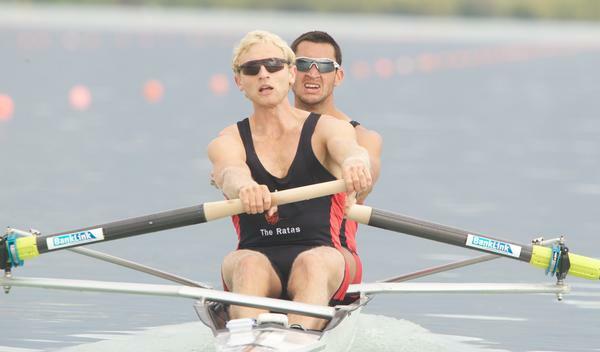 Michael Harrison of Hawkes Bay pipped Matthew Glenn of Waikato by just six tenths of a second in a thrilling race for the Senior Single Scull title. On a day when times were not quick, Harrison's 7 minutes 18 seconds was impressive. There was a close finish in the Men's Club Coxed Fours too, with Blenheim beating Hawkes Bay by just 1.4 seconds after six minutes and 40 seconds of racing. Erin Monique Shelton - a quality Kiwi rower who spent time training at University in the USA - took out the women's Senior Single Scull ahead of Elyse Fraser from Otago University and former squad quad scull racer and netball star Sarah Barnes. That two was a great race, with Shelton stealing it by less than half a length at the line. Hayden Cohen - brother of world champion double sculler Nathan Cohen - had to settle for a close second in the Under 21 single scull behind Central RPC's Joe Wright.